The trend for spring bags other than tiny little bag that you can't fit stuff in, are structured (almost masculine) and of bright colors which catches your eyes instantly from miles away. This bag definitely fits the bill and I actually glad I decided to wait for a month for this bag to arrive at my doorstep. I'm not a fan of preorder items but I feel like I need to give it a try so I did and no regrets! I looove the bazooka pink color. 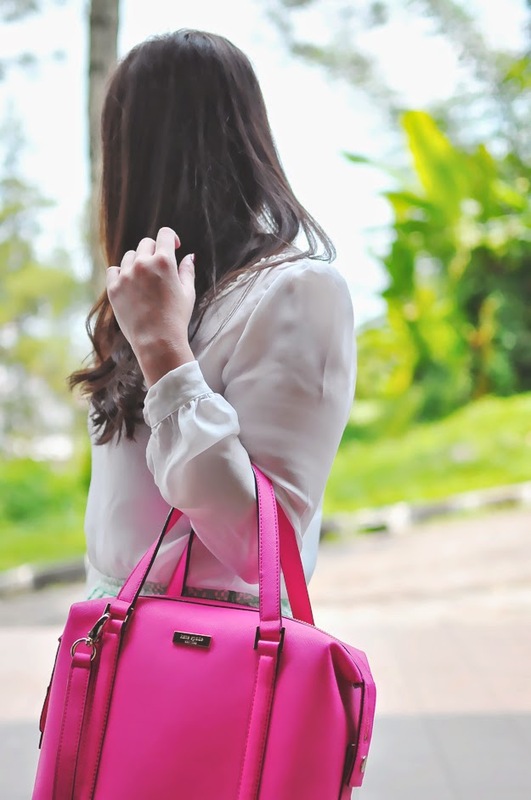 When I'm not parading in floral prints, my outfits are usually consisting of either black or white with jeans and this Kate Spade bag complements those kind of simple outfit perfectly. So I don't know if you can see it but the leather is not smooth leather, it's a saffiano texture and I like it better than the smooth one because it doesn't get scratches easily. I found the size to be very ideal for short people like me (I'm 156cm). It's not too big but spacious enough to be functional (25x20x12cm). I do have complains about the opening of the bag... Even when all the zippers are undone all the way through, it's still difficult to get thick things out like a boxy cosmetic pouch. It's not a big deal tho, I just switch to a flatter cosmetic pouch and problem solved. For some reason, I can't find this bag on Kate Spade website anymore (I'm guessing this one is a last year collection) but it's definitely still available through Nordstorm and Ebay. I saw one in black on Ebay for price comparison. It comes with a Kate Spade dustbag and when I took it out for the first time, I was so happy to smell that luscious leather fragrance. I will recommend the store which helped me to order this bag from USA. She was super helpful and patient with all of my questions (considering this is my first time ordering a branded bag from an online store). Just email me for her contact. Have a lovely colorful Monday, all!